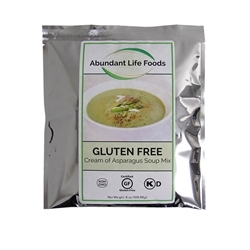 Ingredients: Non-Fat Milk Powder, Potato Flour, Asparagus Powder, Maltodextrin Evaporated Organic Cane Juice, Baking Powder, Xanthan Gum, Sea Salt, Guar Gum. Pour 3 cups water into sauce pan. Add 1 bag of mix. Whisk until dissolved. Place on stove over low heat; bring to slow boil, stirring to keep from sticking.